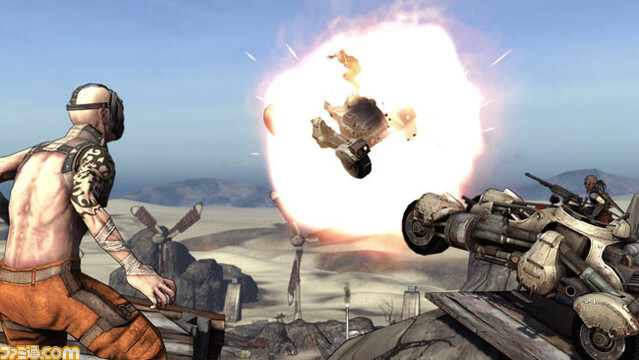 Borderlands presents an interesting mash up of First-Person Shooter and RPG elements, which eventually come together to produce a unique sort of combat system with a lot to offer. Unfortunately, a clunky interface, flatlined plot, and a certain monotony when it comes to environments drag the game down significantly, becoming glaring issues towards the end of the game. On the whole, Borderlands is a solidly built game, and it works well for gamers looking for something a little bit different, but it’s not a particularly compelling or amazing title. What little plot Borderlands has to offer revolves around four mercenaries and their hunt for a supposedly mythical treasure house known as the Vault. The Vault is hidden on a backwater little dirtball known as Pandora, a colony world recently vacated by pretty much anyone with half a brain as the planet entered its “Spring phase,” wherein more or less every carnivorous species on the planet (i.e., all of them) comes out of hibernation and starts looking for someone to snack on. The practical upshot of all this is that the player is taking charge of a gun-for-hire on a planet populated by psychotic criminals, extra-terrestrial predators, and other opportunistic entrepreneurs. The fauna of Pandora is monstrous, and more importantly, hungry. The story itself is usually told through short audio clips, ostensibly broadcasts over the interplanetary communications network, the ECHO net, and progresses by means of a very basic quest structure. The quests that drive the plot tend to follow a simple fetch quest setup, with the game progressing in a pattern of talk to NPC, collect or kill a certain number of MacGuffins, return to NPC, repeat. The story is exceptionally sparse, very easy to predict, and more or less devoid of sympathetic characters. It seems everyone on Pandora is either psychotic, antagonistic, or about thirty seconds from the gloomy bosom of writer-mandated death. True, storytelling isn’t Borderlands’ primary focus, but the overall lack of anything very compelling in the plot and the choppy quest-centric means of delivery takes the story into “why bother” territory. 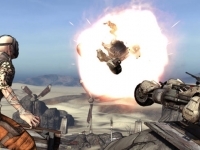 Where Borderlands puts most of its effort is in the combination of First-Person Shooters with RPG elements. Essentially, Borderlands is an FPS game with RPG-style skill trees, leveling, and damage calculation, and on the whole, the end result is fairly solid, though not without the occasional hiccup. At the beginning of the game, the player selects a character from amongst the four classes available; the Soldier, the all-around combatant and combat medic; the Hunter, a hawk-wielding sniper and survivalist; the Berserker, the tank and physical damage specialist; and the Siren, an assassin. Each character has a special ability, called an Action Skill, that can be triggered for special effects and, usually, a nice burst of damage, as well as three separate skill trees full of abilities that enhance or modify the character’s basic abilities and Action Skill. For example, the Berserker gets the Brawler tree, which focuses on raw damage output with melee attacks; the Tank tree, which turns the character into a damage sponge; and the Blaster tree, which turns the focus to the Berserker’s preferred weapons of grenades and rocket launchers. The end result of this setup is that Borderlands offers a very solid level of customizeability for each character, allowing each class to be used in surprisingly varied ways, and in such a way that players are never trapped into one setup. In addition to this, Borderlands has quite a robust multiplayer setup, allowing players to duke it out or play through the main quest cooperatively. The multiplayer focus does create a slight problem for players going through the game on their own, as the way Borderlands encourages co-op is by making certain monsters very difficult for certain classes to take down. For example, the hulking Brutes are basically walking meat walls for everyone but the Berserker, while laser-guided turrets practically require a Siren to dispatch them. For single players, there will always be one kind of enemy whose appearance will be cause for irritated groaning. Though the game’s combination of FPS and RPG elements may make the game easier for role-playing enthusiasts to swallow, it’s pretty clear that the game’s focus is strongly on the shooter side of the equation. From the early chapters of the game, where players must reach level five before being given any abilities, to the critical hits which only trigger on headshots and specific weakpoints, fans of RPGs will be thrown into the deep end of the FPS world at first sight. This isn’t necessarily a slight against the game, as Borderlands’ system ends up balancing elements of both genres fairly well, but the transition is a little rough to players unused to First-Person Shooters. This is most prominent in the early parts of the game, where the RPG elements are at their sparsest. The very brief initial tutorial doesn’t help with this at all. Even fairly significant system elements, such as the weapon proficiency system, aren’t given so much as an introductory nod in-game. By and large, Borderlands is a game that expects you to give the game manual a thorough going over. Even certain story elements — for example, that Roland, the Soldier, was formerly a member of the military organization called the Crimson Lance — are noted only in the manual. Borderlands’ interface is a bit shaky, with a number of loose ends that really could’ve used tying up. For example, the heads-up display uses a simple compass with a marker that will point players in the general direction they need to go in order to complete the next phase of their quest. This may have been an attempt to give the player a general guide rather than the more obvious direction of a minimap, but given that the game still gives players a full map in the menu, the only practical effect the compass has is encouraging players to open their menu frequently when traveling. Other areas of the interface are similarly loose, such as the subtitles, which are poorly matched to the voiced lines and which often interfere with each other when multiple people are speaking at the same time, and the vehicle control, which attempts to combine traditional FPS two-stick control with a third-person perspective, muddying both elements. On the whole, the basic control scheme is at its best when the player is simply running around shooting things, but it encounters increasing difficulty when asked to perform other tasks. The game’s soundtrack is a mostly background affair, with the music only popping up occasionally to provide a bit of ambiance. The lack of a strong theme to the music, along with the fact that it is usually drowned out by gunfire and other sound effects, means that the soundtrack doesn’t have much punch, and ultimately comes off as forgettable. Conversely, the voice acting is quite solid. The story doesn’t exactly provide a wealth of characters, but the ones who do talk are voiced well, with a sort of over the top style that fits well with the rest of the game. Vehicles are absurdly overpowered. Running a monster over is easily ten times more effective than using the mounted rocket launcher. Visually, Borderlands takes a bit of an odd track. The game is almost exclusively cel shaded, down to basic environmental features. This produces very comic book-style visuals, with thick black lines and deep shadow, and the overall effect is quite effective. The only real issue lies in the lack of variety in the environments players will be exploring. Pandora appears to be a one-biome planet, where everything lives in a wasteland or a trash heap, and after a while it all becomes a bit mind-numbing. Overall, the visuals are solid, but the lack of variety in environment does end up making the game come off as a bit bland. Though it presents a wealth of sidequests and various things to do aside from the main story, Borderlands eventually comes down somewhat shorter than most games, at around 20 to 25 hours. The difficulty varies pretty wildly depending on the level and build of the characters involved, but overall Borderlands is not a spectacularly difficult game, especially for players with FPS experience. Although Borderlands has a number of flaws, the end result of its design decisions is a game that effectively blends RPG and FPS elements, and yet skimps so heavily on story that the final product lacks flavor. Borderlands should appeal to gamers looking for something new in the RPG department, but overall, it’s really more geared towards gamers looking for something new in the FPS department. This game was played to completion and reviewed using a retail copy.